Enjoy the most luxurious experience with your loved ones by taking the high standard services of Liberty Toronto Limo Rentals. Our stylish Sedans, palatial Fords, extravagant Limo buses, chic Hummers and posh Escalades are well-equipped with state of the art facilities to indulge the clients in an affluent nightout journey. We offer a sophisticatedly arranged fleet which is capable of fulfilling the diverse demands of clients. A completely private limo and party bus ride managed by the personal chauffeurs is delivered to the clients in unbeatable rates across Toronto. An extremely cozy and lavish ambiance is designed especially for supplicating the nightout plans of the clients. We are proud to offer you a variety of enchanting drives for the most important and most memorable moments in your life. We are glad to facilitate you with our majestic Limos and be a part of your happiness. With our promise of excellence and grace, Limo services Toronto are catering the individual needs of our valuable clients for their meetings, weddings, parties, and airport drives. Our professional staffs are ready to say yes to you any time you call us. Reliable services, safe drive and fantastic ground transportation according to your royal mood is what we are offering. We understand that our customers are great people; so we keep their demand of high quality in our mind and provide them Limo services according to their fine tastes. We know what our valued customers expect from us; therefore, we keep the promise of excellence and our brand position in their minds. At Liberty Toronto Limo, we always look forward to serve the valued clients with lofty service at most reasonable rates. We have latest style fleet packed with exciting and jaw dropping interiors that can be customized to suit the theme of the event. Complementary drinks, assortment of light snacks, and stemmed roses are included in many of our packages. Each of the vehicles is loaded with chilled beverages, glassware, and latest technology music and communication system. Having years of experience in the field, our company has earned a reputation of reliability, professionalism, and excellence. Please feel free to contact us for any kind of queries and get the most sophisticated and higher grade limo service in Toronto. When you contact us for a Limousine, we take it as an honour for us that you chose us to accompany you in your grand journey. You will receive one of the latest models Limo with a trained and professional chauffer. Safety and high quality services during your journey are our identity in the market. Our 6-15 passengers Limousine, luxury Sedan, corporate executive, wedding Limo, Airport Limo, or a night on town are our proud offers to serve you at competitive rates. We also provide Limo transport to the downtown of Toronto and the surrounding GTA for a luxury drive. We have the drivers who are aware of all areas of the tracks we cater. 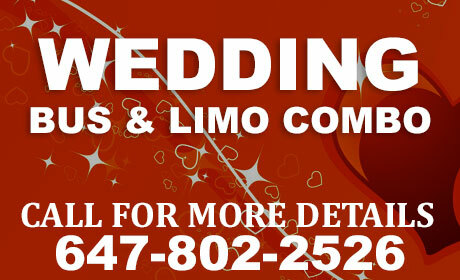 Our company offers the latest and most luxurious of limousines that would suit any kind of wedding celebration. We have on board twelve passenger super stretch Cadillac Escalades that is the most preferred and popular choice of couples who are going to tie the knot. We have a huge collection of limos in variety of kinds and sizes, ranging from affluent Lincoln town cars, stretch limos, stretch hummers, Lincoln navigator, and super stretch limos. We have hired experienced and licensed chauffeurs who will drive off the sumptuous vehicles in style to the desired venue. We believe in providing punctual, diligent, and efficient service and our commitment to profession is reflected in our strong customer base. To end the quest for the pre-eminent limo service for your big day, call us today and get the prodigious limousine service from one of the top-tier companies in town. Our professional and licensed drivers hold experience in driving off luxury and heavy vehicles with utmost perfection. All our chauffeurs are rigorously recruited and hired to deliver efficient and respectful service for making the wedding ceremony an epoch-making and portentous one. Our party buses are mini driving discos with dancing polls and drink bars. You can book a coach for two at minimum and fifty for maximum. Each of the vehicles is styled with plush leather seating, stereo sound systems, snacks, plasma screens, chilled premium beverages, and latest communication systems including Wi-Fi and charging slots. There is variety of drink deals that can be added to any package and interior and décor can be tailored as per the request of the clients. The party bus can stop at your favorite clubs and pubs at various time intervals and those who wish to party on wheels can keep the vehicle going over night. 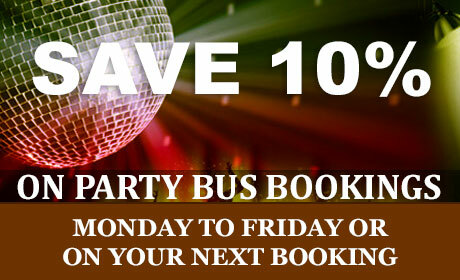 The trend of partying over the course of night in buses and coaches have become popular especially with the youngsters that is why we have designed various packages and deals for party enthusiasts that can be availed at reasonably priced rates. Check out our deals online and make reservations today! Our hospitable staff is always here to help you with innovative ideas to make the party even more rewarding and fulfilling. 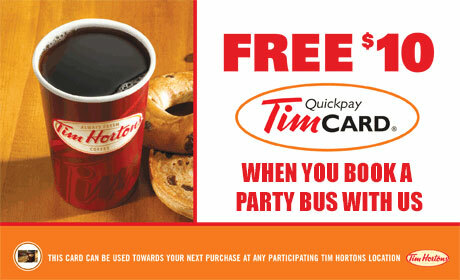 Feel free to drop us a call and we will be glad to cater to you with the most phenomenal party bus service in Toronto. Prom is a one of its kind nights for students of high school and college. Everyone has great expectations for this big event and loads of preparation and planning is done to make everything look beyond perfect. Keeping in view the immense significance of this night, Toronto Limo services and rentals offers eminent limousine service designed particularly for youngsters. There is a huge variety of cars to choose from and all luxury vehicles come packed with latest technology equipment along with GPS navigation system to ensure a safe and secure ride. Prom marks the transition from school life to a bigger and more responsible period of time that is why most of the youngsters want to make an impactful entrance and leave a lasting impression on the friends and viewers. Plan out your special eve by renting affluent stretched limos with us and drive away in sheer glamour and grace. 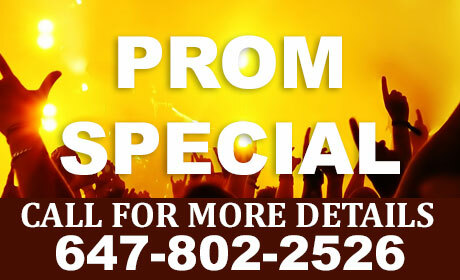 Our diligent customer services staff is always there to assist you in choosing the best package and provide ideas to make your prom transportation a worth remembering deal. We accept all major credit cards and checks and cash is also accepted with parent approval. For more information call or write to us via email. Corporate Limousines are another offer we are proud of. Businesses need frequent meetings and get together and the businessmen around the world are generally in need of travelling and visiting other cities and countries. We welcome our businessmen and corporate clients within the country and from abroad. With our marvellous services of Corporate Limousines to facilitate corporate guests, we take the pride of transporting them to the place of their meeting. Our corporate guests are CEOs, employees or representatives of companies, their families or friends and business icons within the country or from abroad and we take intense care of their needs. We take our corporate guest to the venue of meeting in time and provide them a luxury and comfortable ride addressing their individual needs on the way or the way back to their desired places. Taking them from airport to the meeting hall or any other place is an honour for us. A safe journey with an in time arrival and all the luxuries on the way is what makes us a brand in the Corporate Limo market. We create a harmony and compatibility with the company in creating and maintaining their brand position through our high quality services and luxury Corporate Limo offers.